Come see us at the Bristol Renaissance Faire! 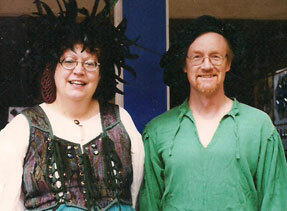 And here's our Minnesota Renaissance shop! Stained glass began for us as a hobby, grew into a passion, and blossomed into a career. We formed Gemini Glass 25 years ago, and have continued to learn and grow as stained glass artists ever since, taking formal classes and sharing ideas with other professionals, as well as presenting our work at street fairs, conventions, mall shows, and renaissance festivals. 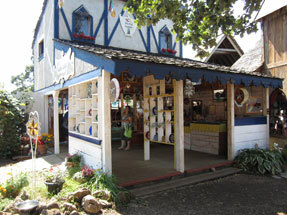 For the summer months of 2016, we will be exhibiting for the 28th year at the Minnesota Renaissance Festival near Shakopee, MN, and for the 26th year at the Bristol Renaissance Faire near Kenosha, WI. 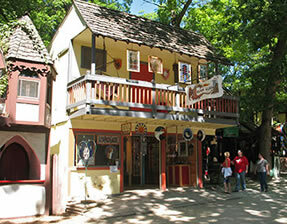 (The Bristol Renaissance Faire is open Saturdays and Sundays and Labor Day Monday from July 9 through September 5, 2016. During the rest of the year, we work on custom pieces for people's homes and businesses, develop new ideas for the summer season, get some much-needed rest and relaxation, and spend quality time with our dog and five cats. We're in the frantic throes of setting up our Minnesota Renaissance shop at the moment, but check our our Facebook page for updates of our activities! All content copyright Gemini Glass, unless otherwise noted.